Whatever your pursuit. Play hard on the Cross Max 20D+. Now designed for really serious off-road use. 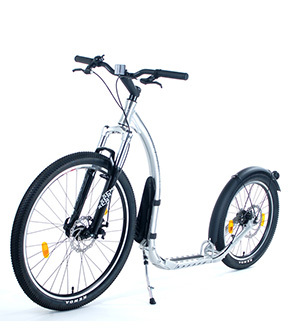 Lightweight alloy frame, and disc brakes. Designed to be taken everywhere. Front fork suspension and disc brakes front and rear make this model the envy of the off-road fleet. If you’re serious about playing hard, then take it for the workout it deserves. Go hard, get dirty. Ideal For Sled Dog Racing. This model gives you all the options, when looking at off-road terrain, speed and comfort.